WHERE CAN I FIND BMW 3-SERIES SEDANS FOR SALE NEAR ME? Are you asking yourself, ‘where can I find new & used BMW 3-Series Sedans for sale near me?’ Advantage BMW Midtown offers an exceptional selection of new, used & certified pre-owned BMW 3-Series Compact Luxury Sedans for you to browse and test drive in Houston, TX. WHY CHOOSE THE BMW 3-SERIES? When we introduced our 3-Series lineup in 1975, we essentially created the compact luxury vehicle genre. Over four decades of engineering evolution has produced our magnum opus of design and performance superiority that have long been the standard by which all other auto manufacturers are measured. Why choose the BMW 3-Series? One test drive will eternally answer that question for you. Looking to tour in style without breaking the bank? The 320i is the perfect match for your luxuriously economic needs. Want an eco-friendly ride? The 330e hybrid fits that bill perfectly. Need to make a strong statement on your way to ‘point B’? Power comes standard with the 340i. The most challenging part in driving one of iconic 3-Series vehicles will be in selecting which one to take home. Don’t let the ‘compact’ name fool you. Our 3-Series interiors are expertly designed to convert virtually every inch of the cabin into luxurious brilliance. Take your place behind the wheel and let our engineering expertise envelope you in the highest quality elements, tech, and luxurious accoutrements on the market today. We’ve worked hard to earn all of the awards and accolades automotive safety experts can deliver. All you really need to know is the 3-Series is filled with groundbreaking safety and security features expertly designed for one reason: total driver and passenger safety. 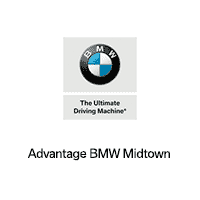 Stop by Advantage BMW Midtown today at 1305 Gray St, Houston, TX 77002 to test drive a new, used, or BMW certified pre-owned Compact Luxury Sedan. Our knowledgeable team of BMW specialists are standing by to help you find the perfect vehicle. Browse our online inventory, drop by, or call (888) 685-7158 now to learn more. We look forward to serving you!